The first CD devoted to the complete output by this important New York stage performer. Shows the fusion of West Indian calypso rhythms with hot jazz and even vaudeville influences. Includes some of the fantastically rare sides made for Okeh’s short lived 65000 West Indian series. Jazz collectors note – this is HOT black jazz! Possibly Carl Edlund (sax), possibly Tom Emerson (vln), Fred Hall (pno, leader, arranger), possibly Albert Russo (bjo), possibly Joseph Mayo (perc.). Possibly Rupert Cole (clt-1-alto sax-2), unknown (guitar box beaten as percussion-3), possibly Lionel Belasco (cuatro). Probably Porter Grainger (pno), possibly Rupert Cole-1 (clt), possibly Rupert Cole-2 (sax), Gerald Clark? (gtr), possibly Lionel Belasco (cuatro), probably Sam Manning-3 (bottle and spoon). Probably Porter Grainger (pno), unknown (clt), possibly Rupert Cole (sax), Gerald Clark? (bjo). Unknown (pno), (cnt), (clt), (sax), Gerald Clark? 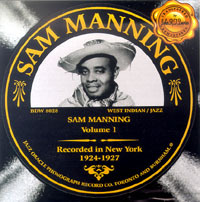 (bjo), probably Sam Manning-1 (dm). Unknown (clt), (sax), Gerald Clark (gtr), Unknown (bjo), (sb), Sam Manning vocal-1. Donald Heywood (pno), Cyril Monrose? + Unknown (tnr saxes -1), Cyril Monrose? (tnr sax -2), Gerald Clark? cuatro (rhythm gtr? ).